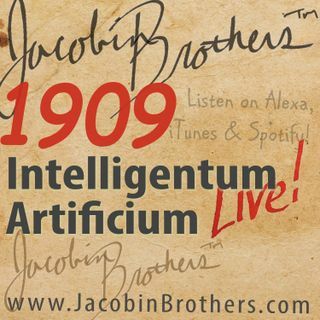 JBL1909 / Intelligentum Artificium | Jacobin Brothers™ Live! Artificial Intelligence is being touted as the best thing since sliced bread, but evidence and prognosticators suggest it might be the worst thing since burnt toast. Walk with us down the road of Symbolic AI and Neural Networks to meet the autonomous order-taking robot at the local fast-food restaurant. In the news today: (On Drudge Report) AI Cameras Spot Shoplifters BEFORE they steal: Vaak, a Japanese start-up uses footage from existing CCTV videotape, alerts re POTL theft to follow! AOC is displaying Artificial Intelligence: The New Green Deal arguably applies a fabricated intelligence, or what Marc might call fuzzy logic, to justify her initiative. Re: News & Whether, Hillary standing up for what she believes. She likely believes she'll a) happily spend the massive funds paid into the Clinton Foundation and b) strive for relevance, to be heard. Curetalage: The act of leaving one's cottage cheese in the fridge too long.